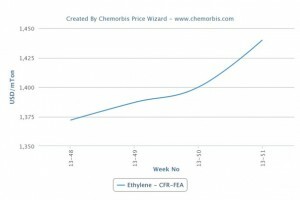 Spot ethylene prices rose for a second consecutive week in Asia, pushed up by tight supply as per the pricing service of ChemOrbis. Shipments from the Middle East are said to be limited and a number of planned maintenance shutdowns starting as of the first quarter of 2014 are expected to keep supply tight. Spot prices climbed by $35/ton from last week on a CFR Northeast Asia basis while they are suggesting a slightly larger gain of $40/ton on a CFR Southeast Asia basis. 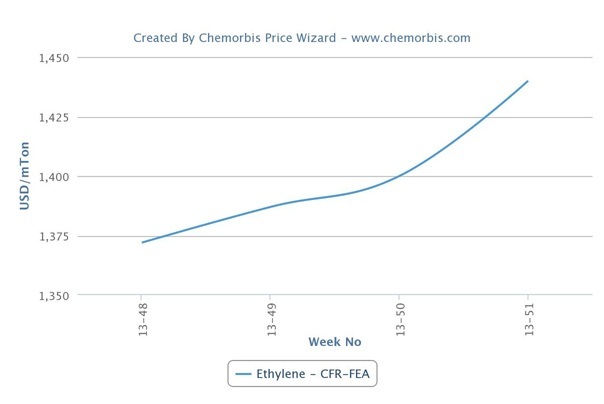 Spot prices on a CFR Northeast Asia basis are up by almost $80/ton from early December levels, when ethylene prices were below the $1400/ton threshold. Japan’s Asahi Kasei will shut their Mizushima cracker in the second half of February 2014. The 504,000 tons/year cracker is expected to resume operations in April. Tosoh Corporation will conduct a month-long turnaround at their 527,000 tons/year Yokkaichi cracker in Japan between March and April. Showa Denko’s 690,000 tons/year Oita cracker will be shut for maintenance in March. South Korea’s Lotte Chemical will shut their Daesan cracker in March and their Yeosu cracker in May. Both crackers, which are estimated to have a combined ethylene capacity of 2 million tons/year, will remain offline briefly for four days. Thailand’s PTT Global Chemical’s 460,000 tons/year cracker in Map Ta Phut will undergo planned maintenance between February 9 and March 17. Taiwan’s CPC Corporation will take their 700,000 tons/year Lin Yuan cracker offline for maintenance in April. According to ChemOrbis, more crackers are scheduled to undergo turnarounds in the second quarter of 2014. China’s Zhenhai Refining & Chemical will shut their 1 million tons/year cracker for a 45-day maintenance in May. Keiyo Ethylene’s 768,000 tons/year cracker in Chiba, Japan will be taken offline for maintenance from May to June. Mitsubishi Chemical will shut their two Japanese crackers for maintenance between May and July. The 540,000 tons/year Kashima cracker will undergo turnaround from early May to early July while the 500,000 tons/year Osaka cracker will be shut for a month-long maintenance starting as of late June. Japan’s Mitsui Chemicals is also mulling over conducting a maintenance shutdown at their 500,000 tons/year Sakai cracker sometime between the second quarter and the third quarter.